Who are the Banderovites and how are events in Western Ukraine 70 years ago linked to today’s Ukrainian conflict? Why is the role of Ukrainian nationalismin the overthrow of former president Viktor Yanukovych so controversial and why are many observers concerned about its influence on the policy of the new Ukrainian state? One of the key aspects of the (mis-)information war between the West, Russia, and Ukraine is, from the point of view of the Russian authorities and the media community, the ostensibly leading role the so-called “Banderovite neo-Nazis” are playing in the new political life of Ukraine. The Russian authorities justified the “Crimean operation” as necessary for the protection of the Russian population from “fascist thugs”. Meanwhile, the revolutionary Ukrainian authorities and those supporting them in the West dismiss the charges, considering the claim “a lie fabricated by Kremlin propagandists”. 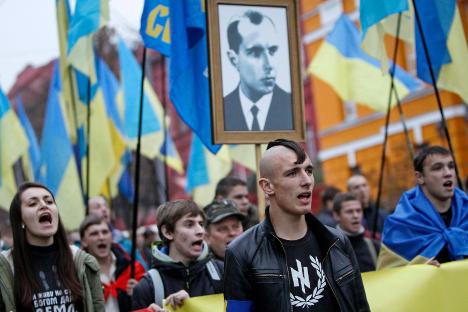 Who was Stepan Bandera and what relevance do ­events in Western Ukraine during the Second World War have for today’s conflict? Why is the role of Ukrainian nationalismin the overthrow of former president Viktor Yanukovych so controversial and why are many observers concerned about itsinfluence on the policy of the new Ukrainian state? Ukrainian political life has for many years been determined by the opposition of two approximately equal electorates in the country: the West - and the Central region which gravitates towards it - and the South-East. The population of these regions is culturally diverse: The eastern part is dominated by ethnic Russians, while in the West, Ukrainians are relatively more common. They are different also in an economic sense: The East is mainly industrial, while the West is predominantly agricultural. The Euromaidan movement was made up mostly of representatives of the western regions. Their ideology does not involve public consensus with representatives of the East, nor does the ideology of Ukrainian nationalism, which is unified and uncompromising. Ukrainian nationalism emerged as an ideology in the first third of the 20th century and bears a close resemblance to German Nazism and a number of other far-right ideologies of the time. This is attested to by its extreme intolerance, itscraving for immediate political action, violence, and the denial of rights to minorities. Many Ukrainian nationalists consider it necessary to use an “iron fist” to build a nation, which involves the harsh oppression of non-Ukrainian elements in society. The problem is that these non-Ukrainian elements in Ukraine are the majority. In the southeastern part of the country the population is overwhelmingly non-Ukrainian, and even in the Ukrainian-speaking region of Western Ukraine, Galicia, non-Ukrainians represent a considerable percentage of the population. Stepan Bandera was a Galician-born political activist who swiftly rose to prominence in the burgeoning Ukrainian nationalist movement, based in Western Ukraine, which gathered pace during the 1930s. Prior to WWII, when Western Ukraine was a part of Poland, Stepan Bandera’s Organization of Ukrainian Nationalists (OUN) had been engaged in anti-Polish political and subversive activities with the goal of achieving Ukrainian independence. But after these lands were annexed by the USSR in 1939, the Soviet authorities became the new enemy. During the Second World War, the OUN’s militant wing, the Ukrainian Insurgent Army (UPA), led by Bandera and his right-hand man Roman Shukhevych, mainly operated in Western Ukraine. It was during this era thatsome of the most controversial pages in the history of Ukrainian nationalism were written. The Banderovites had a complicated relationship with the German occupying forces, but their actions were always determined by the fact that their main enemy was the USSR. This approach was driven by the ideology of Ukrainian nationalism, according to which the main opponent of Ukrainians are “Moskali” (Muscovites) - that is, Russians, as well as Poles and Jews. The Third Reich realized that the Banderovites could be of use: They were used to carry out the Nazis’ goal to “rid the Ukrainian land of unwanted elements”, that is, among other elements, the Jews and Communists. However, Bandera’s idea of an independent Ukraine was not shared by the Third Reich, and as a result Bandera was imprisoned in a concentration camp, where he remained until 1944, albeit in significantly more comfort than other prisoners. During the Nazi occupation many Ukrainian nationalists served in the German military structures: the Galician SS divisions, the Nachtigall Battalion, the Ukrainian Legion, and local police units. At the same time, military units that had not been subordinated to the Reich were also engaged in ethnic cleansing of territories they considered as native Ukrainian, periodically engaging in armed clashes with the German occupation forces. There were notorious anti-Jewish pogroms in western Ukraine in 1941, as well as the so-called Volyn massacre 1943-1944, during which, according to Polish historians, about 150,000 citizens of Polish ethnicity were murdered. Russian and Ukrainians who disagreed with the views of Ukrainian nationalists were also subjected to terror. In 1944, Bandera was released from the camp to lead members of the UPA in the struggle with the advancing Red Army and Soviet administration. Banderovite activities reached their widest scope from 1941-1945, and in the early postwar years, when British and American intelligence services established contact with the Bandera movementduring the early Cold War. However, by the mid-1950s, sabotage activity petered out, and many agreed to return to a peaceful life. Bandera himself lived in Munich after the war under the protection of MI6, the British intelligence service, with which he was collaborating, until 1959, when he was killed by KGB agent Bohdan Stashynsky with a special gun that fired a syringe loaded with potassium cyanide. Both Bandera and Shukhevych were posthumously awarded the title Hero of Ukraine by President Viktor Yushchenko, though in 2010 they were deprived of this title by his successor Viktor Yanukovych. In April 2014, more information about the activity of the Banderovites was revealed in documents declassified by the Russian Ministry of Defense. These documents shed new light on the activities of the Banderovites and their logistical support of the German occupying forces, as well as their role in carrying out ethnic cleansing. In addition to the destruction of the Jews, the Banderovites also exterminated Poles and other nationalities, including Russians. Polish historians claim about 150,000 Ukrainian inhabitants of Polish ethnicity were killed during the course of the so-called Volyn massacre of 1943-44. Moreover, Banderovite terror was also turned upon Ukrainians themselves who disagreed with the ideology of Ukrainian nationalism. Post-Soviet southeastern Ukraine differed from the west of the country all these years in that it did not have its own identity or national identity. This resulted in quite a sad circumstance, given that even when representatives of the southeast were in power in Kiev, the whole humanitarian sphere of politics was left in the hands of Ukrainian nationalists from Galicia. So, when it came to education oversight and information policy, there was no division in the country, as it all conformed to a single nationalist trend. In fact, Ukrainian nationalists had absolute power over the education system, as well as the strongest influence on media policy. Therefore, a new generation of Ukrainian children learned from textbooks that propounded an ultra -nationalist view of Ukrainian history. Regularly broadcast TV programs promoted Ukrainian radical nationalist propaganda. Today, Ukraine is reaping the fruits of this school of education and information, as many of the people pushing the “Ukrainian” agenda are under 30 years old, even though their parents do not emphasize any pronounced Ukrainian identity. Oleg Nemensky is a PhD in Historical Sciences and Fellow at the Institute of Slavic Studies and the Center for Ukrainian and Belarusian Studies of MGU, and is also a leading researcher at the Russian Institute of Strategic Research.